SueJac (#) (1968-1980), gaff-rigged schooner, 54 feet long with a cement hull built in 1968. During a strong northeast blow (Santa Ana wind condition), SueJac dragged anchor outside of Avalon Harbor, Santa Catalina Island, and was wrecked against the breakwater. Commercially salvageable items were removed by divers, and now sport divers view her wreck as a part of the Catalina Underwater Park at the Casino. 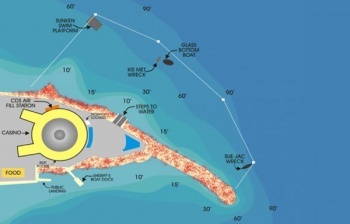 The wreck lays on its starboard side and a 90-degree angle to the breakwater with its stern in about 60 feet and its bow in 90 feet of water. This page was last edited on 28 November 2016, at 13:08.